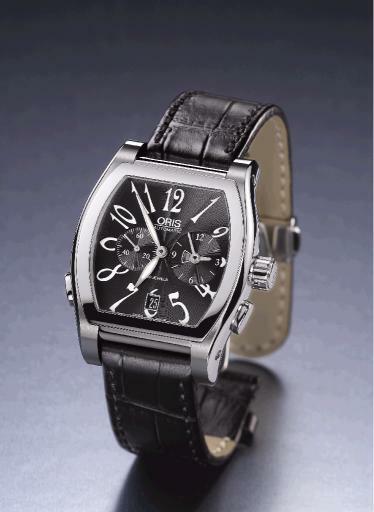 Oris’ Miles collection has been enhanced with this world timer version. Measuring 38.5mm x 48.3mm, this is not a small piece! Movement is an automatic (base ETA ebauche) with second time zone, hours and minutes from the centre, small second at 9 o’clock, hours and minutes of second time zone at 3 o’clock, and day date at 6 o’clock. The dial is guilloche-stamped with imprinted Arabic luminous numerals, a stainless steel case with a curved sapphire crystal, spherically cut on the inside, and water resistance of 30 meters. The display back is mineral crystal with 4 screws.